We’re stoked the Urban Polo team will be using Yoogo Share EVs to drive polo players to and from their fantastic event in Hagley Park on March 2nd. Flying down for the event from Auckland, the team running the Urban Polo event, will be chefuering some of New Zealand’s top polo players in BMW i3s and Hyundai IONIQs, and using the cars to get around Christchurch while they’re there. A modern twist on ‘the sport of kings’, the Heineken Urban Polo merges polo with party, with DJ’s, food trucks and a Heineken bar adding to the fun of a smaller field size than traditional polo. We’re giving away two tickets to the Heineken Urban Polo PLUS a weekend in a Yoogo Share E. To enter the draw to win, head over to our Facebook Page. Our short training sessions will familiarise you with Yoogo Share's pure electric cars and give fully registered drivers a chance to get behind the wheel of a car, with a complimentary drive after the training session. We’re stoked to announce our members in Christchurch have made 100 tonnes of carbon emission savings since our launch in February last year. Thanks to Christchurch City Council who were instrumental in bringing electric car sharing to the city, our members have saved the equivalent emissions of 250 trips the length of New Zealand by driving Yoogo Share electric cars for business and personal use. With over 1,000 Kiwis dying each year from air pollution related diseases, and cities like Auckland committing to an emission free CBD by 2030, we’re thrilled to offer a way for Kiwis to drive zero-emission electric cars without the expensive costs of ownership. Find out how we calculate carbon emission savings, and what else we’re doing for the local environment on our Carbon Savings page. 382 people died on New Zealand roads as a result of crashes in 2018 - the highest road toll we’ve seen since 2009, giving New Zealand the 5th highest fatality rate (per capita) of OECD countries . While the government and police are working hard to improve the safety of New Zealand roads through safety improvements, increased presence of traffic officers and public education on safe driving, at Yoogo Share we believe we have a responsibility to do our part in making kiwi roads safer for all drivers. So, what are we doing to reduce the number of people dying on New Zealand roads? Prior to becoming a member of Yoogo Share, we run a background check with the NZTA to ensure anyone driving a Yoogo Share car is fully qualified, with no disqualification or restrictions. All Yoogo Share members must be over 21yrs and have held their full driver license for a minimum of 3 years. All members who sign up to Yoogo Share must agree to abide by our safe driving policies as outlined in our Terms & Conditions. Yoogo Share’s advanced GPS technology sends us alerts when drivers are breaking the speed limit, accelerating aggressively, braking harshly or cornering erratically. Drivers who are found to be driving dangerously are contacted and reminded of our safe driving policies. Any drivers who continue to drive dangerously, or are found to be excessively braking speeding limits, will be banned indefinitely from driving Yoogo Share cars. Yoogo Share BMW i3s, Hyundai IONIQs and Hyundai Kona’s are packed with the latest safety technology and are both 5-star ANCAP rated, making both models some of the safest on New Zealand’s roads. This makes the road safer for occupants of Yoogo Share cars, as well as making the road a safer place for other drivers, pedestrians and cyclists. Since EVs are a little bit different to drive than traditional cars, we offer free driver training sessions every week to familiarise new members with how to drive Yoogo Share electric vehicles. From navigating the cockpit and driver controls, to explaining safety features and sharing tips on driving EVs safely, we cover it all in these weekly training sessions to leave drivers feeling confident behind the wheel of Yoogo Share cars. Want to know more about our safe driving policies? do you have suggestions on what other health and SAFETY features you think we should develop? Just in time for last minute Christmas Shopping, book either of our Hyundai IONIQs from Papanui, Fendalton or Lyttelton hubs and park in The Crossing car park or the West End car park for FREE while you do your Christmas Shopping or City Errands. You can park and charge up in any available Yoogo Share car park in The Crossing or West End car parks (excluding the West End rapid chargers) - but don't tap off on these chargers as it will end your booking. Offer available to book until Jan 31 2018 to Yoogo Share private members. Plus, take a Hyundai IONIQ for the weekend and you could win a selection of delicious treats from Little Bird Organics. We have six gift packs to give away! We’ll randomly pick 6 weekend bookings and will leave a gift pack waiting for inside the car of the lucky winners. From right to left: Yoogo Share Development Manager, Tracey Jay. Yoogo Share General Manager, Kirsten Corson. Waste Management National Manager Customer First, Marsha Cadman. Waste Management Sustainability Manager, Adam Weller. Christchurch based car sharing service Yoogo Share has won the Smarter Transport Award at the 2018 Sustainable Business Network Awards. 650 people attended the black tie NZI Sustainable Business Network Awards dinner in Auckland last night to find out what businesses were leading sustainability in the country. Yoogo Share were up against Waste Management NZ, Civic Contractors, Enviro NZ, Tranzit Group, Yoogo Share and Mevo for the Smarter Transport Award. Judges said they were impressed with the companies bold launch of 100 pure electric vehicles in Christchurch, offering shared electric vehicles to both business and private members. The service, which was officially launched by Lianne Dalziel and Jacinda Ardern in February, has just reached a milestone of 80 tonnes of carbon savings, so it was a double celebration for the car sharing service at the awards. Kirsten Corson, General Manager of Yoogo Share, acknowledged the outstanding vision and support from Christchurch City Council which started working with the company in 2016 to deliver a city wide pure electric car sharing service – the first of its kind in Australasia. Christchurch City Council has exited 55 combustion vehicles from their fleet, alongside a number of other local businesses including Warren and Mahoney, Meridian Energy and Aurecon who are using the shared electric fleet as an alternative to pool cars, taxis and rental cars. Christchurch City Council is the only council in the country to made this level of commitment to electric vehicle technology to date. The Yoogo Share scheme offers Hyundai IONIQs and BMW i3s in 8 different hubs around the city and has become a popular choice for over 4,000 business and private members. At $14.50/hr it’s even more affordable than using a Lime Scooter. Car Sharing is a well established transport option in Europe and North America, where on average 9 cars are removed from the road for every shared car that is made available. Corson confirms that Yoogo Share has already seen members sell their second car, or selling their only car, to use the fleet of shared electric cars. As the electric car movement heats up in New Zealand, a local start-up has chosen Christchurch as the first city in the country to launch its innovative, future-focused car sharing initiative. Cantabrians using Yoogo Share have already saved 50 tonnes of carbon, or the equivalent of more than 20,000 litres of petrol being used. For Kirsten Corson, getting behind the wheel of a traditional combustion engine vehicle is akin to driving an old tractor. But put her behind the wheel of an electric car and she’s a happy woman. Not surprising then that she is helping more Kiwis experience the thrill of going electric, as the General Manager of Yoogo Share, the company behind New Zealand’s first 100 percent electric car sharing service. Launched in Christchurch in February, Yoogo Share has brought 100 pure electric vehicles (EVs) to eight (and counting!) locations throughout Christchurch. It’s free to join and there are no membership fees; simply sign-up (membership criteria applies), get sent a Yoogo Share access card, then book and drive the vehicles as and when needed. Christchurch City Council initiated the service when they put out a tender in 2017 for electric car sharing as part of the city’s rebuild. Fast forward to early 2018 and Kirsten found herself officially launching Yoogo Share alongside Christchurch Mayor Lianne Dalziel and Prime Minister Jacinda Ardern. Yoogo Share business members love driving the electric cars for getting to meetings and running errands. A more convenient option than ride hailing or public transport, they’re also great fun to drive. Plus, you only pay for the time you use the car, with all other costs including insurance and storage covered by the hourly rate. Meanwhile, for private members, the shared electric cars are a great alternative to a second car, with many families choosing to sell their second car that often sits unused. For people who commute to work via public transport, walking or cycling, the cars are ideal for those times when you do need a car such as picking up shopping or longer journeys when public transport isn’t an option. So why share? With petrol prices higher than ever before and the high cost of purchase for electric cars, you can drive an electric car without having to buy one. In fact, no insurance, WOF, registration, repairs, maintenance or fuel costs. Plus, with no tailpipe emissions, Yoogo Share is helping improve Christchurch’s air quality. With 50 tonnes of carbon savings already under their belt, Yoogo Share’s members are expected to make 100 tonnes of carbon savings by Christmas. To mark the milestone, the company partnered with the Department of Conservation, Meridian Energy and Hyundai to help restore the Evans Pass valley, planting 1,000 native trees to represent the kilometres travelled by Yoogo Share members. To try out the electric car sharing experience, the first hour is free for 1,000 bookings for Yoogo Share private members, thanks to their energy partners in Canterbury, Meridian Energy. Private members can get the first hour of their booking free for up to five bookings, giving everybody the opportunity to try Yoogo Share cars. So what are you waiting for? After all, sharing is caring. We’ve put together guides for taking a Yoogo Share car out of Christchurch, to let you know the best places to charge your car (and yourself) in and on the way to Ashburton, Akaroa, Kaikoura & Timaru. With 200km ranges, Yoogo Share cars can travel out of town easily, with a little planning. We’ve done that for you, so you can just enjoy the drive. See the following Journey Planners to find out more about travelling out of Christchurch. We’re working on more Journey Planners, but if there is a destination missing from this list that you’d love to see, please email us, and we’ll get cracking on putting something together for you. Otherwise, visit PlugShare - the crowd-sourced app that with comprehensive info on charging stations around the country. Christchurch people using electric car sharing service Yoogo Share have saved 50 tonnes of carbon, or the equivalent of over 20, 000 litres of petrol being consumed[i]. Kirsten Corson, the General Manager at Yoogo Share, says the company now has over 3,000 members in Christchurch. “We’re aiming to hit 100 tonnes of carbon savings in Christchurch by the end of this year. The level of support we’ve received from businesses and private members in Christchurch has been fantastic. To celebrate the major milestone, the company recently planted 1000 native trees in Evans Pass to help restore the valley. Yoogo partnered with the Department of Conservation, Meridian Energy and Hyundai to mark the milestone, along with members of their car sharing service. “The native planting efforts in Evans Pass represent the kilometres travelled by our members. It’s a great way to give back.” Corson said. The concept of electric car sharing was an initiative led by the Christchurch City Council as part of their transition into becoming a smart city and reducing emissions of their staff driving around the city. To date, Yoogo Share has around 100 pure electric cars in their fleet across eight hubs in Christchurch and have recently opened a new hub in Auckland. The cars are available to book by the minute, hour, day, night or weekend and are a solid option for businesses or individuals who want to make some smarter decisions around their cars & mobility. We want you to experience just how great our fleet of shared electric cars are to drive, so with the help of our friends at Meridian Energy, we're offering the first hour free for 1,000 bookings for Yoogo Share private members. All you need to do, is sign up to Yoogo Share as a private member (it's free to join), enter the promo code 'meridian' when you make a booking, and you'll get the first hour on us - easy. As part of International Drive Electric Week, we're offering a super discounted overnight rate. For the week of September 9 to 17, we're offering Yoogo Share private members a chance to take a Yoogo Share car home (or anywhere they want to go) for just $10! AUCKLAND CBD HUB: NOW OPEN! Grab a new BMW i3 or Hyundai IONIQ from our first Auckland hub in the ANZ Centre on Albert St.
With only two vehicles based at the Albert St hub, advanced bookings are essential. All existing members can now book the cars. If you're new to Yoogo Share, sign up and we'll send you an access card - it's currently free to join Yoogo Share and there are no membership fees. The people of Christchurch have made carbon savings of 50 tonnes since February by choosing to join Yoogo Share and drive pure electric cars. This initiative was led by Christchurch City Council which had the vision to reduce emissions and accelerate Christchurch’s transition to becoming a smart city. In recognition of these carbon savings and the people who have made it happen, Yoogo Share is planting 1,000 native trees in Evans Pass to help restore the valley. Working with the Department of Conservation & Meridian Energy, Yoogo Share has invited their business and private members to help mark this milestone together. The planting will take place on September 23rd as part of Conservation Week. With road vehicles accounting for 17 percent of all CO2 emissions in NZ[i], electric vehicles have the potential to greatly reduce New Zealand’s greenhouse gas emissions. New Zealanders are really starting to embrace electric cars, with almost 10,000 electric vehicles now registered around the country. Corson says the high cost of EVs including the cost to buy and install chargers is a barrier for many Kiwis, which is why Yoogo Share’s pay-when-you-use model has been so attractive to Cantabrians. University of Auckland Professor Shaun Hendy is on a self-imposed year without flying to highlight climate change. Hendy chose to drive pure electric during his recent return trip from Christchurch to Queenstown because of the reduced emissions from electric cars. Hendy said that driving himself in a pure EV was so much better from a CO2 perspective, and that charging the car cost just $37 one-way. Car sharing is quickly becoming a global phenomenon, with innovative cities like Christchurch encouraging the use of shared cars as an extension of their transportation network. People use car sharing alongside public transport, ride-hailing, walking and cycling for their daily mobility needs. Yoogo Share’s fleet of electric cars are available for hire by the minute, hour, day, overnight or weekend. Located in 8 hubs around Christchurch, including the airport, Cantabrians and visitors to the city can enjoy the benefits of driving electric without the cost of ownership. Yoogo Share, part of a locally owned fleet management and vehicle leasing company, recently launched New Zealand's first 100 per cent electric car sharing service - in fact, it's the largest scheme of its type in the southern hemisphere. Officially launched in Christchurch by Prime Minister Jacinda Ardern on February 15, 2018, the Yoogo Share electric car sharing service is an initiative the Christchurch City Council hopes will drive transformational change in terms of both carbon emissions and attitudes about future vehicle ownership. The service provides businesses and the public with access to a pool of 100 electric vehicles (EVs), including BMW i3s and Hyundai Ioniqs, on a shared basis from 10 hubs and 100 chargers around the city. Yoogo Share general manager Kirsten Corson says: "Whilst we are not the total mobility solution for a person or business we deliver a cost effective and sustainable option." The traditional internal combustion engine has been around for over a century. Fuelling, maintaining and operating them is easy due to a well-established, extensive network of refuelling and vehicle servicing operators. People understand and trust them. Meanwhile 100 per cent EVs, while appealing for multiple reasons, are something of an unknown quantity. But that wasn't about to scare off Yoogo Share's vision of the future. Corson says: "We learned that a lot of businesses wanted EV fleets, but they came at an initial higher capital cost. Not only the cars, but the charging infrastructure. And because it's relatively new and fast-moving technology, many businesses and the general public have found it challenging." These very difficulties actually strengthen the business case for car sharing, where the costs are spread across multiple users, reducing risk and translating capital cost to operational expense. "We were fortunate enough to get a public private partnership in place with the Christchurch City Council, and to receive co-funding from the Government's Low Emission Vehicles Contestable Fund, administered by EECA. The Council, along with twelve foundation customers and over 3000 drivers, created an immediate commercial benefit in dollars and cents that meant those customers could go green without the hassle." says Corson. And the rental costs are pretty impressive, starting at just under $15 for an hour, which is less than the cost of an Uber. An 'overnighter' costs as little as $36. So how does Yoogo Share achieve such low prices? Part of it, Corson explains, comes down to an EV's low maintenance, with only around 20 moving parts in an electric engine, compared with nearly 2000 in an internal combustion engine. The other part is that the company looks to absolutely maximise the time the vehicles are in use. "We've got fantastic technology fuelling the back end and within our App which makes it simple, convenient and efficient to access a car," says Corson. What's the reaction been like so far? "Anyone who gets into one of our EVs for the first time tends to have a 'Eureka' moment," says Corson. "Experiencing the power, smoothness and silence of an EV for yourself is really the only way to fully appreciate their capabilities. When you drive EVs for a while its hard to go back to a combustion engine." And Yoogo Share is giving the people of Christchurch the opportunity to do just that. "The easiest way to get started is to simply download our App and register or register via our website: www.yoogoshare.co.nz." Of course, Christchurch is just the start of what the company plans to be a nationwide service. "Obviously we'll start in the major population centres, but there is demand in the smaller towns too." "So, yes, we're hoping to give people across the country the opportunity and chance to drive a pure EV and get hooked on all the economic and environmental benefits they offer. And possibly challenge the current concept of traditional car ownership at the same time." There are Yoogo Share cars at Christchurch Airport if you are heading that way. The Southern Hemisphere’s biggest deployment of pure battery electric cars and largest pure EV car sharing model was officially launched in Christchurch today by Prime Minister Jacinda Ardern. Yoogo Share, a bold new initiative adopted by the Christchurch City Council will see a pure EV fleet of 100 cars, ten hubs and 100 chargers made available around Christchurch. Twelve key businesses with 3,000 drivers are already working with the Yoogo Share cars, removing 115 combustion engine vehicles from their fleets. Membership is now open to private users. Yoogo CEO David Jenkinson said the technology powering the fleet is very much the future as it provides a cost effective alternative to company cars, rental cars, taxis and even private ownership. “Imagine landing at Christchurch airport on business, just one minute walk to your Yoogo Share car which you access via your membership card or phone. At less than $15 an hour to drive a new BMW i3 or Hyundai Ioniq – it’s a no brainer,” says Jenkinson. With zero tail pipe emissions and less congestion, Yoogo Share will deliver positive health benefits for Christchurch city and contribute to a smarter and renewable city. Christchurch City Mayor Lianne Dalziel says that sustainability is at the forefront of this initiative. General Manager Kirsten Corson said that sustainability is also an important part of Yoogo Share’s business. “Although Yoogo Share is a technology based mobility company, sustainability is important to us and extends beyond our pure EVs and into us contributing to our communities” says Corson. In addition to helping Kiwi businesses ‘go green’, the Yoogo Share offering also appeals to millennials, who are increasingly choosing public transport and rideshare services over car ownership. Canterbury University student Matthew Knight, who has been working closely with Yoogo Share says the idea of having all care no responsibility access to a pure EV has huge appeal to his peer group. Business and private users simply sign up at www.yoogoshare.co.nz and book a vehicle. Rates are based on the minute, hour, or day, whichever is cheapest. Users of the service can pick up a car at a Yoogo Share hub. When finished they simply drop it back to the hub and plug it in to charge. Yoogo Share has active hubs at Christchurch Art Gallery car park, West End car park and Christchurch International Airport, with Fendalton, Papanui, Lyttleton, the University of Canterbury, Ara Institute, The Crossing and The Terrace launching over the coming weeks & months. The largest 100 per cent electric car-sharing scheme in the Southern Hemisphere has been wheeled out in Christchurch today. 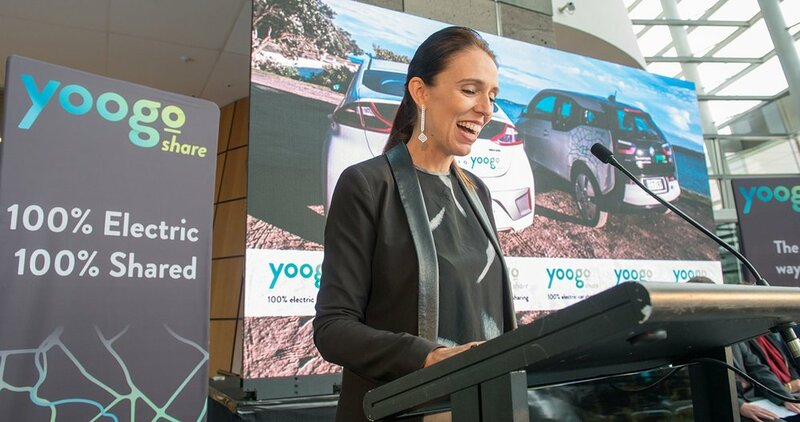 Prime Minister Jacinda Ardern helped launch the Yoogo Share initiative that has been adopted by Christchurch City Council and will put a pure EV fleet of 100 cars, 10 hubs and 100 chargers around the rebuilding city. Twelve key businesses with 3000 drivers are already working with the Yoogo Share cars, and removing 115 combustion engine vehicles from their fleets. Membership will open to private users next month. 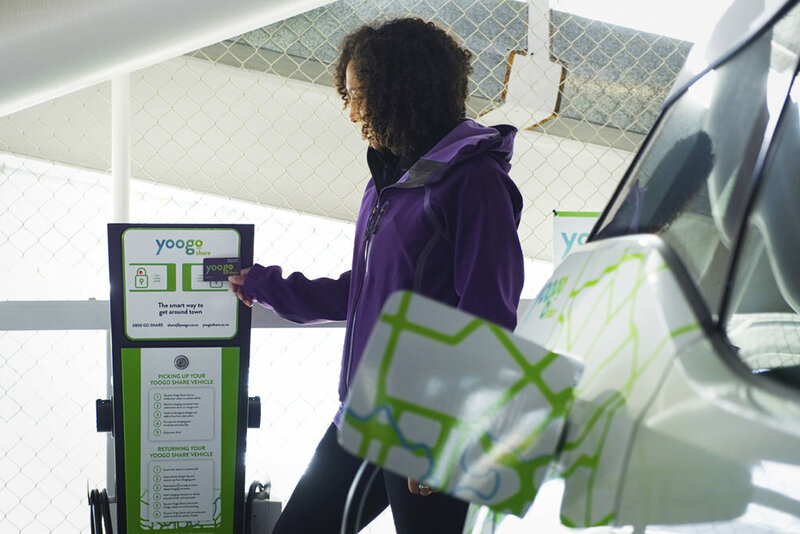 Users can pick up a car at a Yoogo Share hub and, when finished, drop it back and plug it in to charge. Yoogo chief executive David Jenkinson said the technology is a cost-effective alternative to company cars, rental cars, taxis and even private ownership. "Imagine landing at Christchurch airport on business, just one minute walk to your Yoogo Share car, which you access via your membership card or phone. At less than $15 an hour to drive a new BMW i3 or Hyundai Ioniq – it's a no brainer," he said. "While electric vehicles are increasing in popularity, they can be challenging to adopt because of the extra cost of the vehicles, not to mention costs for chargers and installation. Sharing is a great way to enable the benefits of an EV without the hassle or cost." In addition to helping Kiwi businesses "go green", the Yoogo Share offering also appeals to millennials, who are increasingly choosing public transport and rideshare services over car ownership. Canterbury University student Matthew Knight, who has been working closely with Yoogo Share, says the idea of having all care no responsibility access to a pure EV has huge appeal to his peer group. "As a student the last thing you want is to have to fork out for a car that's going to need costly maintenance," he said. "We still want the freedom to get around – and with Yoogo Share we've got access to a cool, new and sustainable option that's more cost effective than taxis or Uber." Yoogo Share has active hubs at Christchurch Art Gallery car park, West End carpark, Christchurch International Airport, Fendalton and Papanui. Lyttelton, the University of Canterbury, Ara Institute, The Crossing and The Terrace will get hubs over the coming weeks and months. In May last year, Europcar and Volkswagen New Zealand teamed up with Auckland, Wellington and Christchurch airports to offer corporate travellers free electric cars to travel between business meetings. The keys are collected at the Europcar desk and the cars are picked up from, and dropped back to, prime parking spots outside the terminals. The initiative was aimed at "normalising" the cutting-edge technology and testing the public's desire to go electric. A Kiwi-first initiative is giving Christchurch businesses and the public access to a pool of 100 electric vehicles. Prime Minister Jacinda Ardern officially launched Christchurch's first fully battery powered electric car sharing service at the Christchurch Art Gallery on Thursday. The project is run through Yoogo Share, a New Zealand electric car sharing business. PM Jacinda Ardern and Mayor Lianne Dalziel in one of the new electric share cars. Mayor Lianne Dalziel said she was proud Christchurch was the first city in New Zealand – and one of the few cities internationally – with such a service. "This service will deliver improved environmental and health outcomes and help the Council achieve its goal of becoming carbon neutral by 2030." Ardern said encouraging the use of electric vehicles was an important part of the Government's plan for New Zealand to become carbon neutral by 2050. "It's great we could help Christchurch lead the way with this innovative car sharing scheme," she said. Yoogo Share general manager Kirsten Corson said the company was pleased to be able to open up the car share service to the public.